All our processes are backed by experienced professionals, who work in close proximity with the clients to meet their requirements. Apart from a good facility, we maintain a well defined Total Quality Management that allows to maintain strict quality paradigm and to undertake various quality tests for quality assurance of products.Our focus on meeting the requirements of clients from manufacturing, construction, architecture, interior and other industries has further been taken ahead with our well managed and wide spread distribution network. 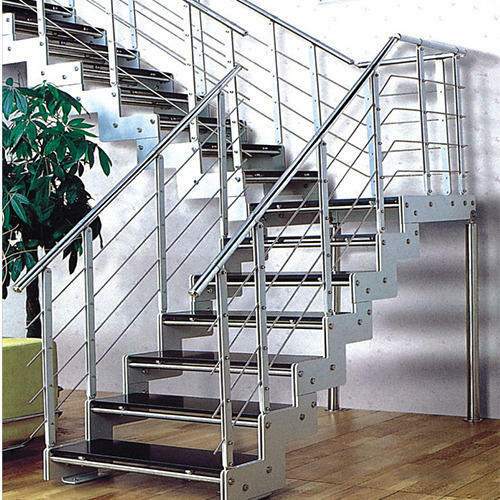 For best Stainless Steel Railings in India kindly contact us. Our organization Shree Laxmi Enterprises Pune, we are offering most reliable and comprehensive solutions for Glass railing, balcony railing, staircase railing, Aluminum Design Railing and Stainless steels fabrication products. We are engaged in serving the clients across both commercial and residential sectors. Our services are known for being reliable, cost-effective, flexible and in sync with the industry standards. We are among the best known companies that deal in the manufacturing and supplying of Design Railing such as Glass Design Railing, Staircase Design Railing and Glass Design Railing. These are available in wide ranging shapes and specifications. These design railings are available at economical prices. Our quality tested before being dispatched into the market. These railings are widely used at various places such as restaurants, homes etc. In addition to this, these design railings are resistant to rust or corrosion. These have accurate dimensions and long life. Further, these are quality tested individually prior to their shipping so that our clients get the best possible product without compromising on the quality factor.